A portion of meat, which can also include a fillet of fish, taken from the most tender part of the animal and formed into a round steak to be prepared. As a term that is most often applied to cuts of beef, the Tournedo is the cut taken from the small end of the tenderloin. It is sliced so the cut ranges in thickness from 3/4 to 1 1/4 inches, is 2 inches or slightly larger in diameter, and weighs approximately 5 ounces. Because Tournedos are so lean, they may be wrapped in bacon, lardo or some type of fat to keep them tender while cooking. 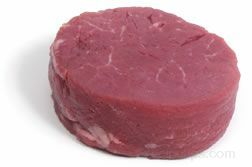 Beef tournedos are usually cooked by broiling in a shallow pan or by grilling. When served, if they are small in size, they are often served as a pair of steaks. In addition to beef, Tournedos may be cut from pork, veal, fish, and other foods which use the term somewhat loosely in order to create a food item that is tender in texture, round in shape, possibly held together with string to keep the rounded shape, and garnished with sauces or breads when served. When made from fish, the fillet, such as salmon, the steak is formed by using the center part of the fillet, cutting it into an almost rectangular shape and then cutting it lengthwise down the center to form two narrow strips of meat. One strip is then placed on top of the other and they are rolled into a round cylinder or log-like shape, tied or bound in plastic, and baked. The two strips are then sliced into small, round pieces of steak for serving. Several of the common foods that are often associated with Tournedos include Tournedo Oscar and Tournedo Rossini or Torunedo a la Rossini as it is also known. Tornedo Oscar is a beef loin, pan fried and served on a croûton of bread, a toasted piece of bread, round in shape that is sized similar to the cut of beef. The meat is then garnished with crab meat, tips of tender asparagus, and covered with a Bérnaise sauce. Tournedo Rossi, which is named after an Italian composer for his love of the dish and fine foods, uses the beef loin fried in clarified butter, paired with a slice of goose liver (foie gras), enhanced with a shaved truffle (mushroom), and topped with a Madeira sauce.